Freshman pitcher Brittany Baroni hurls a pitch to a Santa Rosa Junior College hitter on April 25. 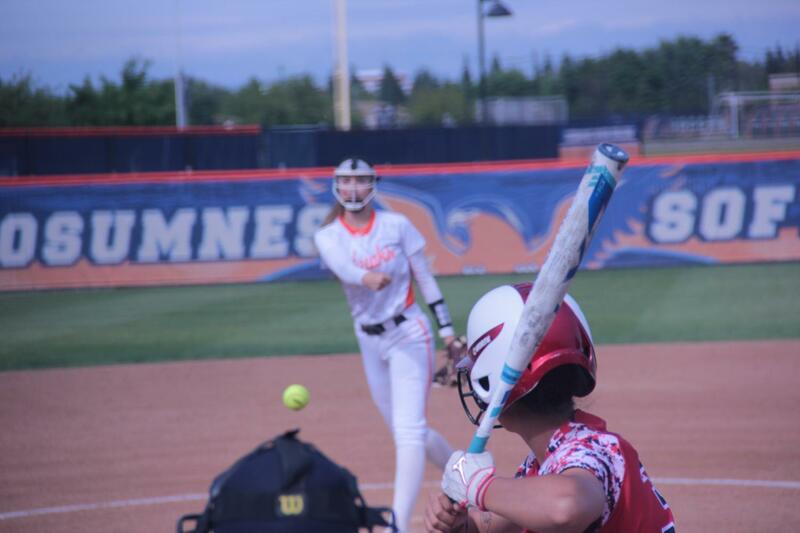 In a blowout game that ended in the sixth inning, the Cosumnes River College softball team achieved a dominating victory over Santa Rosa Junior College 10-0. This was the Hawks’ eighth consecutive win, capping off the regular season with their 30th win. Head Coach Kristy Schroeder said that she felt confident about the Hawks coming into the game. The Hawks started scoring in the bottom of the first. After two walks and two outs, freshman third baseman Taelor Ford singled and drove in two runs. The Hawks defense, including freshman pitcher Brittany Baroni, made quick work of Santa Rosa in the early innings, allowing no runs and only one hit through four innings. “I thought Brittany did an excellent job on the mound,” Schroeder said. Schroeder likewise complimented the team’s defensive performance. In the bottom of the fourth, with one out and a runner on second base, Ford hit a double and drove in the runner from second, bringing the score to 3-0. However, the inning ended with a strikeout and a force out at third base leaving three runners on base. In the bottom of the fifth, Ford once again came to the plate. After a foul ball hit to right field by Ford, sophomore center fielder Alexus Acosta bolted for home and dodged a tag in a headfirst dive for home plate, securing the fourth run for the Hawks. The sixth inning proved to be the most pivotal inning in the game. In the top of the sixth, the Bear Cubs had the bases loaded with two outs. However, a line drive toward third base was caught by Ford, ending the inning for Santa Rosa. The bottom of the sixth started off with freshman shortstop Miranda Rodriguez hitting a leadoff triple to deep center field. A sacrifice bunt by Acosta was able to drive in Rodriguez for another run, bringing the score to 5-0. Two walks and a single to left field by Ford loaded the bases for the Hawks. A walk by sophomore left fielder Lindsay Lambert brought in sophomore catcher Courtney Beatty from third base for another run, making the score 6-0. Freshman second baseman Veronica Smith, who had previously singled twice and got a fly out in her previous three at bats, hit a homerun on the first pitch and ended the game with a grand slam. The Hawks are now looking towards the playoffs. Schroeder said she feels confident in her team’s ability to perform well in the postseason.